Peacock Cichlids are some of the most colorful fish in the world. They are native to Lake Malawi and are one of the most friendly and peaceful members of the Cichlids. Before we start we’ve summarized the key information in the fact table below. 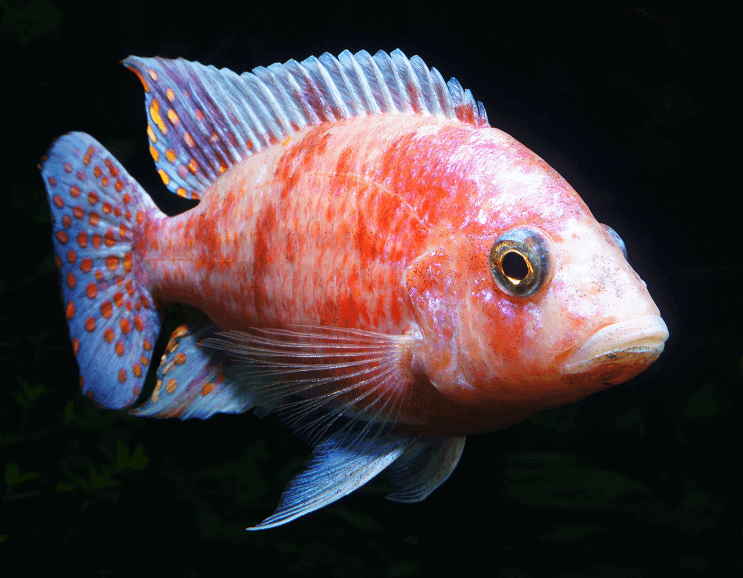 Get Your Free Bonus: Download your Peacock Cichlid guide now to find out more about this beautiful species and how to care for them. Can You Keep Peacock Cichlids Together? The Peacock Cichlid is a stunning species of fish native to Lake Malawi; it belongs to the Astatotilapia genus. There are at least 22 different species of Peacocks, the majority of which have stunning coloration. Their coloring can vary from blues, reds to yellows and will stand out in any aquarium. The most popular of which being the blue (Aulonocara Nyassae); it will therefore be the focus in this article. 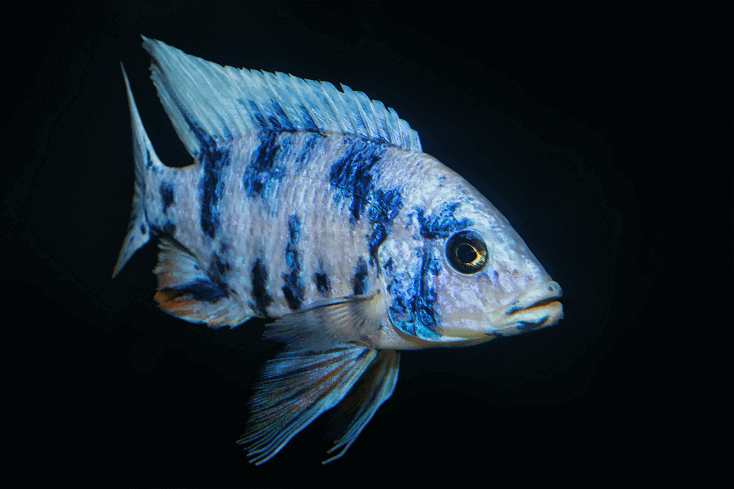 The majority of Cichlids have a reputation for being aggressive, whereas the Peacock Cichlid is fairly peaceful. Males can be territorial, but on the whole they are peaceful and can make good community fish. Peacocks are bottom dwellers and in the wild in Lake Malawi, will be found at depths of 6 to 40 meters. A common behavior they will display is hunting for food amongst the sand. They will hover above the sand and once they detect any movement from any invertebrates they will strike. This is also a behavior you will see in aquariums as they sift through the substrate. They are an active swimmer and are one of the most peaceful Cichlids available. If you’ve seen other varieties of Cichlids, you will know that they are some of the most vivid colored freshwater fish in the fishkeeping hobby. Peacock Cichlids are no different. They are some of the most colorful fish you will find, ranging from blue, gold, orange to yellow. You will also notice than instead of a matt color, their color is in-fact iridescent. Interestingly their color is permanent, whereas other Cichlids’ color is dependent on their mood and breeding status. The different varieties of the Peacock Cichlid are essentially the same fish with different coloring; this color varies depending on the region of Lake Malawi it came from. It’s important to state here though that both the juvenile and females are typically a drab gray, so if you’re looking to add color to your tank make sure to buy a male. Your Peacock should grow to around 6 inches long and is characterized by an oversized lateral line system. In my experience the two most common varieties are the red and blue Peacocks. This is in fact a variety of the Flavescent Peacock. It is a manmade creation and not naturally occurring. It is the same size as other Peacocks except with a red coloration. When buying one you might see them referred to under other names such as Ruby Red and Rubin Red. A metallic blue, to a bright yellow, and during breeding season its color will become even more enhanced. Like all other types of Peacock, its female counterpart is a gray color. Finally, a word on the OB Peacock. These are hybrids and are cross breeds between pure Peacock Cichlids breeds. OB Peacocks are the same size as regular Peacocks and offer some unique coloration. 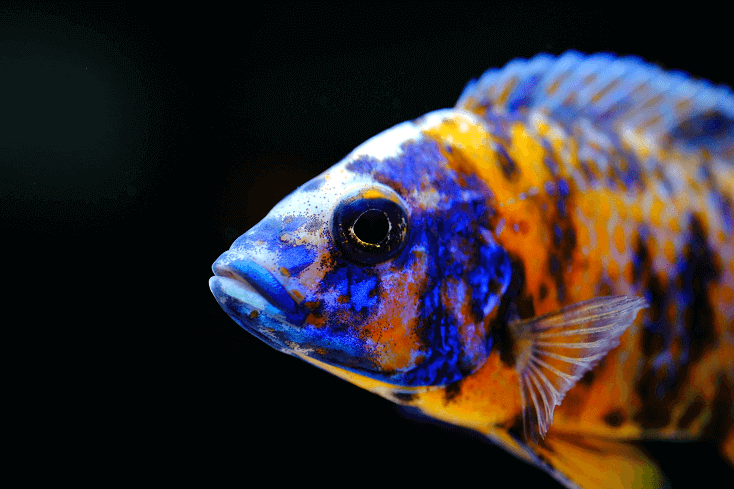 In a home aquarium you should expect a male Peacock Cichlid to grow to around 6 inches long, with females being slightly smaller. 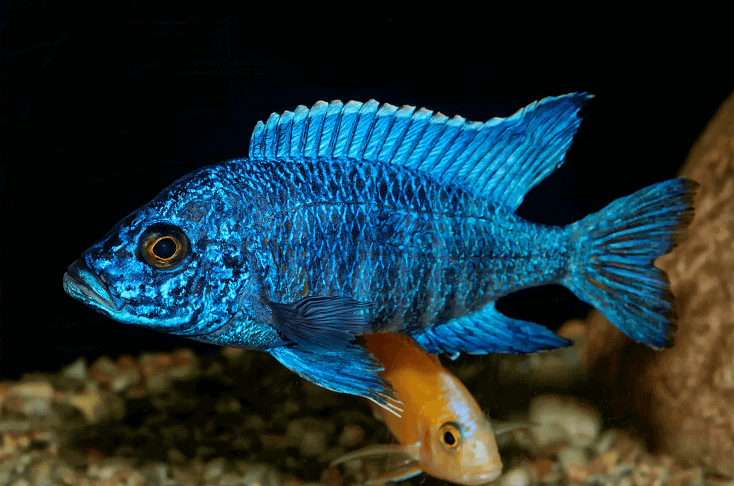 As mentioned in our general overview section, all Peacock Cichlids come from Lake Malawi, therefore your aquarium should closely resemble to conditions found there. The lake is known for having alkaline water that is known for clarity and is extremely stable in terms of its pH level and other key parameters. The areas of the lake in which the Peacocks live, are characterized by sandy and rocky areas. So, we recommend you mimic these conditions within the tank. 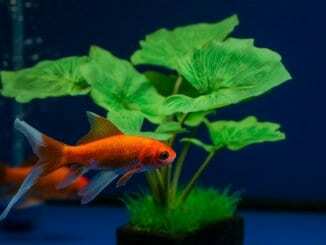 Matching their natural environment will reduce the stress levels of your fish and will provide them with the optimal conditions they require to stay healthy. Now onto setting up your aquarium for Peacocks. Firstly you will need at least a 55 gallon tank. This tank should have a sandy substrate and lots of rocks. As they like to sift through the substrate, don’t use gravel because it can cut their gills. You should position the rocks to create plenty of caves and hiding spaces. Whilst Peacocks aren’t known for their aggression, they are territorial. Breaking up the aquarium with lots of caves helps to reduce their territorial behavior. If you’d like to decorate your aquarium with plants you can do so. They will not eat the plants but like other Cichlids, they have a tendency to dig and ‘reposition’ plants. For this reason you should only use hardy plants (think Java Ferns or Anacharis) and make sure to anchor them. If you’re planning on keeping a community of them, then a tank of at least 100 gallons is needed. The larger the tank the fewer territorial issues you will have. Also remember that they are active swimmers so a horizontal tank is preferable here as it gives them more open space to swim in. One final point about habitat and tank requirements; if you are mixing different varieties of Peacocks then make sure to accommodate to their individual needs. Some prefer more rocky environments, whilst others prefer sand. This is why a larger aquarium is needed when mixing Peacocks so you can adequately provide for their needs. As for water conditions within the tank, you should keep the water temperature between 76-82°F. PH levels must be kept within 7.8-8.6. Interestingly as Lake Malawi is a huge body of water it isn’t subject to rapid changes in water chemistry of sudden drops in temperature. For this reason you should ensure that your aquarium’s water temperature remains as consistent as possible. What Size Tank Do Peacock Cichlids Need? A Peacock Cichlid will need an at least a 55 gallon aquarium. If you’re planning to keep a community of them then a 100 gallons tank is needed. Peacock Cichlids are omnivores meaning they eat both meat and plant/vegetables. In the wild they are bottom dwellers meaning they will sift through the sandy substrates for food. This will typically be insects, larvae, zooplankton and other crustaceans. You should try to emulate this inside your aquarium. Start by making a quality cichlid pellet the core of their diet; you can then supplement this with meat and vegetables. Interestingly you should avoid tubifex worms and all mammal meat as it can cause Malawi bloat. You can however feed them flakes, just make sure it is suitable for cichlids. In terms of feeding frequency you should aim to feed them several smaller portions throughout the day instead of a single large feeding; this helps to maintain the water chemistry. Cichlids in general get a bad reputation for being aggressive and in general they deserve this reputation. Fortunately though Peacock Cichlids aren’t like other Cichlids and are the ‘tamer’ members of the family and generally much more peaceful. 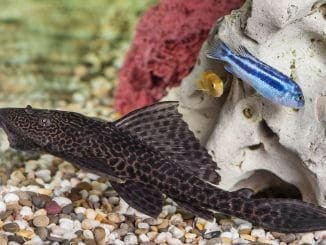 The first thing you need to do is make sure that any fish you want to keep with your Peacocks can survive in the same water parameters; for this reason many people choose tank mates who are also native to Lake Malawi. However not every Lake Malawi cichlids can be a tank mate with Peacocks. Other more active fish such as Petrotilapia, Labeotropheus, Pseudotropheus and Mbuna should be avoided. The best way to keep them together is to make sure you maintain a ratio of 1 male to 4 females. This will help create schools within the aquarium. Also remember that males are territorial so make sure to provide them with enough space; a 100 gallon tank is enough for a community of six. As mentioned in the behavior section above, male Peacocks are territorial and tend to be solitary. So when you want to breed Peacocks the first thing you need to do is make sure each male has their own territory to prevent conflict. Fortunately though like other Cichlids, they are fairly straightforward to breed in a home aquarium. If they need encouraging, you can raise the water temperature to 82˚F as spawning typically occurs in warmer water. Once they have established their territory (typically a cave) the courting process can begin; this is very entertaining to watch. To lure the females into their cave, the male will ‘perform’ at the entrance of his cave. This will typically look like the male making quick sudden movements and darting to get her attention. Once the female joins the male, they will enter the cave and the female will lay eggs into the nest. The male will fertilize the eggs and the female will then collect the eggs in her mouth; Peacocks are mouth brooders. She will stay inside the cave now until the fry are ready to hatch. She will stay inside the cave and incubate them in her mouth for up to 28 days until they hatch (you should expect between 12-50 little Peacocks). After the fry have hatched, in an aquarium the female will generally leave them to their own devices. The Peacock Cichlid is one of the easier and most peaceful Cichlids to keep. 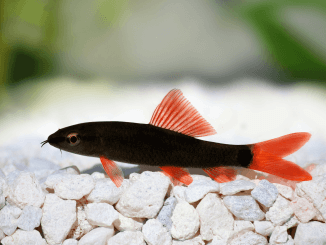 Their stunning coloration and entertaining personality make them a fan favorite. Remember when preparing their aquarium to create lots of different territories using caves and rocks to prevent aggressive behavior. They are ideal for both new and experienced fish keepers and will make a fantastic addition to most tanks. Can peacocks live peacefully with other fish such as a red tailed shark and large neon tetras? Question: I would like to start a new 125 gallon tank. I was under the impression that if you get all Peacock male cichlids and no females it leads to a more peaceful tank. Is this true? can i keep 2 different color peacock cichlids in a 55 gallon tank with other compatible fish?